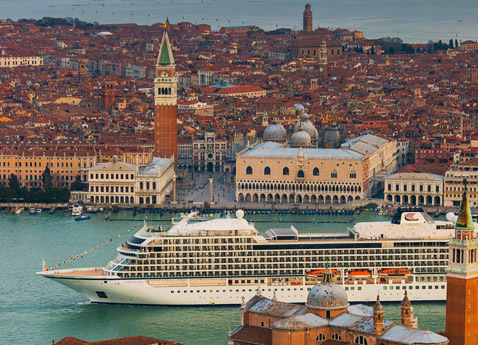 The Viking Sea sailing by Piazza San Marco in Venice. Viking Cruises are best known for their leisurely river cruises that cater to a more leisurely crowd (and not necessarily the target audience of this blog). But the small river boat company is making some big waves in the cruise business with some much bigger boats. The Viking Sea, the second in a new class of Viking cruise ships, recently embarked on its maiden voyage from Istanbul to Venice. The Viking Sea was officially christened on the Thames this week after journeying to London before it spends the season sailing among the fjords. Classified by Cruise Critic as “small ships,” Viking’s ocean ships have a gross tonnage of 47,800 tons (as compared to the 130,000 tons of the Disney Dream) and boast 465 cabins (which is 785 fewer than the Disney cruise ship). Viking has four more of these cruise ships on order as they expand their fleet. The Viking Sea, like her sister ships, was designed to incorporate design elements to pay homage to Nordic heritage and to help guests immerse themselves in local surroundings. A glass-backed infinity pool cantilevered off the stern offers unobstructed views and the indoor-outdoor spaces offer plenty of places to eat under the stars. In response to the fear that the Viking name will soon become synonymous with family fun time as they hopscotch from destination to destination, the company is heavily marketing these ocean liners as “the thinking person’s cruise.” Viking wants to maximize time in port with late evenings and overnights to give cruisers plenty of time to experience the local culture. The ocean cruises by Viking are relatively new and we can’t wait to hear the reviews from the discerning travelers who are looking for a different kind of cruise.